A U.S. financial crisis in 2018, if not sooner, is all but assured. Only the blind can still talk about America becoming “Great Again.” If anything, America will experience the Great Depression again. The reason for the pessimism is simple and it should have become obvious by now: debt. The problem has gotten worse, because there is no way President Donald Trump will be able to launch the political agenda he promised during the electoral campaign. Political weakness means economic inaction. Indeed, there are many questions about whether there will even be a Trump political agenda to discuss in 2018. You see, the appointment of special investigator Robert Mueller into Trump’s alleged dealings with Russia all but signal the end of the Trump presidency. Neither a weakened sitting-duck Trump, nor an impeached one (should it come to that) could launch the infrastructure improvement plan and, much less, the ambitious income tax reform. That’s because there are people who have received marching orders to bring Trump down. The wise folks won’t be betting on Mueller clearing Trump of wrongdoing. He’s there to secure a conviction for the “Russiagate” episode. The market rally that started last November was predicated on Trump’s electoral victory. The Dow Jones Industrial Average hit 21,000 a few months ago because of what Trump was going to achieve for corporate profits. Donald Trump’s promises about replacing Obamacare, implementing tax cuts, and regulations were the only aspects to infuse optimism in the market after last November. There wasn’t—and there isn’t now—anything else to warrant the kind of valuations that have driven Wall Street to ignore the rules of gravity. U.S. public debt is at record levels while private debt and auto loans could trigger a financial collapse anytime. The markets have been behaving optimistically, as if on autopilot. The forecasts of many companies, especially the emerging tech players, have been too favorable (my particular pet peeve is Snap Inc (NYSE:SNAP)). But is it warranted? History teaches us that when forecasts are too optimistic, they fail. Certainly, when expectations are for the best—especially in the case of the stock market or the economy—anything less is disappointing. As an example, when a company has been performing well and ends up delivering a good quarter, the stock will only go up if the “good” results are better than expected. When the forecast for overall market performance fails to meet overly ambitious outlooks, there is a real danger. The danger is that investors and lawmakers will overlook risks that the markets present. If enough of them do this, the result could be the collapse of the entire system. That’s what happened in 1929 and 2008, and that’s what is happening now. The danger of a financial crisis in 2018 becomes clear, considering the following five risks that the world seems to be ignoring. These five risks include another real estate bubble, untenable levels of personal debt, a banking crisis, and the potential implosion or sudden slowdown of the European economy. The fifth risk, which is the overriding one, is Trump’s presidency. 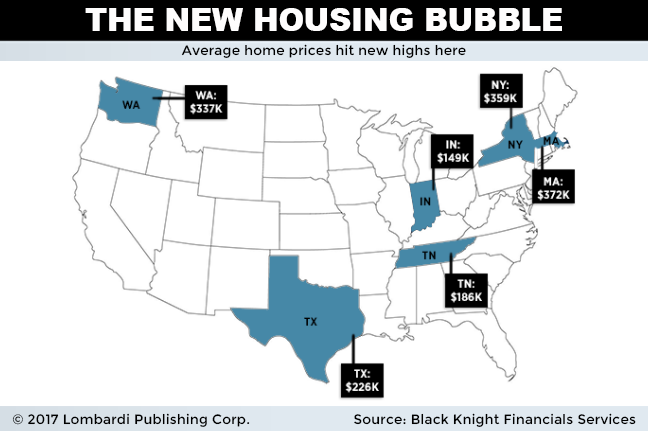 The first risk is the real estate bubble in the United States. Before anything else is established, the subprime crisis resulted from the inflation and then sudden burst of real estate prices in the country. This might be the No. 1 risk, in terms of increasing the odds of an economic collapse. Investors, especially when it comes to optimism, rarely learn. Bullish expectations are a kind of self-perpetuating drug, which can make addicts out of the most cautious and pessimistic of investors. It just so happens that real estate prices in the markets that suffered some of the biggest drops during the bubble of 2006–2007 (which heralded the financial crisis of 2008 and the Great Recession), are rising once again. The same behaviors that real estate buyers displayed in the housing mania that exploded in the United States in the 2002–2006 period are back. That was the period of the subprime crisis. The problem now might not stem so much from risky subprime mortgage debt repackaged into risky derivatives. The current problem is simpler: buyers might be paying too much for the houses they buy. The risk now is that, if the U.S. Federal Reserve lifts interest rates, taking the rising stock market valuations as a sign of economic health, it could produce something analogous to the subprime crisis. Higher interest rates will lift mortgage rates for the middle classes beyond their threshold level of affordability. In other words, it’s richer Americans’ turn to feel the pressure. Meanwhile, because of the housing bubble, construction companies have been encouraged to build more apartments. This has started to flood the market with supply. If supply rises faster than demand, prices suffer. What’s more, real estate investors who buy property will have their rental income undermined. In short, too many homeowners could end up having to sell their properties because they can no longer afford the mortgages. When they do so, they will lose on the value because of excessive supply. They will still owe high-interest mortgages. The risk of a major default on loans has risen to levels not seen since 2007–2008. This could all happen over the next few months, increasing the chances of another financial crash in 2018. Of those, you can assume that almost half of student loan debtors are behind on their payments, given that when (or rather, if) these graduates get jobs, they will be earning relatively much less than their parents. The risk of bailouts is less only than the risk that the many recent college graduates are starting out their lives tens of thousands of dollars in debt before they get their first jobs. That means they will not be able to rent or purchase the rising number of houses being built in the current real estate market boom. The banks will soon start crying to the government, since they are facing defaults and bankruptcies on all fronts. 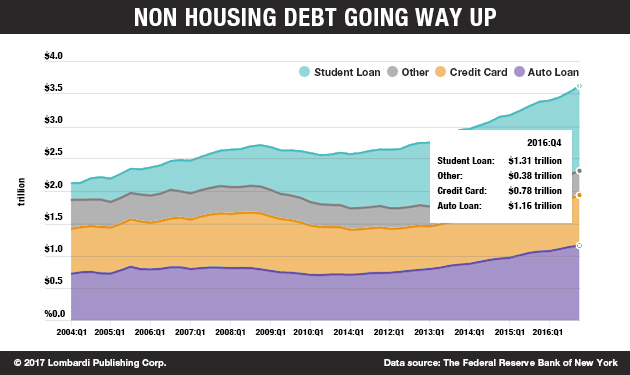 America has series of debt problems, of which mortgages and student loans are only the tip of the iceberg. American banks, therefore, can look forward to another debt crisis. Trump’s solution—to allow them to make risky investments again by repealing the Dodd–Frank Act—will only increase the risk of implosion. The Dodd–Frank Act has not been great; it has not even been good (see above), but it was the best that could be done under the circumstances to try to prevent another 2007–2008 situation. European banks, which in 2008 were left relatively unscathed by the financial crisis, have weakened in recent years. European banks are suffering from the sluggish growth of their respective countries’ economies. Low interest rates make it difficult to shift bad debts out of their accounting books, while some, like Deutsche Bank, the largest German bank, is heavily leveraged in derivative risk. At the first sign of trouble, Deutsche Bank could implode and drag down most European banks down with it. Meanwhile, Donald Trump’s promises could never reach the policy stage. Trump is facing an internal political crisis that could put him out of office. That would all but terminate the fiscal cuts that have encouraged the record-breaking Dow Jones index performance in 2017. Even if he survives the Russiagate probe—now rendered gloomier—Trump’s political stock has suffered. This means the president risks failing to get his tax cuts past Congressional scrutiny. A failure on these fronts could deflate both the stock market and corporate investments. It would raise panic and trigger another recession. Worse still, all these problems may occur sooner, rather than later, meaning that a financial crisis in 2018 is almost inevitable.